We hit 11 sales today! It rained until 10AM, and then it got absolutely beautiful out. Unfortunately, the damage had already been done, and there weren't as many sales as there could've been. I'm still a little off my game in terms of wheelin' and dealin', and I made a couple of mistakes today. First off was that we saw a non-GOTY Halo marked for $5, and I didn't offer anything. I probably would've liked to have it for $1, maybe even $2, but I didn't say anything. It's no huge loss really, but I still should've made the offer. The worst they can say is no, and the best is that you get a good deal. The second mistake is a little more understandable. We found a small non-advertised sale which consisted of a single card table with a couple of things on it, seemingly being tended by a 12-year-old boy. I take a look at the table, and find a few gameboy games. The only things of interest were cart-only Pokemon Silver and Pokemon Crystal. When asked how much he wanted, he said "Well...they both still have save-data on them...so how about...$15 bucks. ", which I of course scoffed at. At that point, his Dad came out of the garage carrying some more stuff. The dad looked like Ernest P. Worrell if he grew his hair out, grew a short scraggly beard, and developed a drinking problem. He walks over to his kid, and yells "STOP TALKING AND GET IN THE HOUSE!" The kid says that he's only trying to sell his games, and the dad yells "YOUR GAMES!? WHO PAID FOR THEM!? I SAID TO SHUT UP AND GET IN THE HOUSE!" So the kid goes running inside, and I don't really know what to say. The guy turns to me and says "How about $4 for each, ah hell, $3 each". If I were at my best I would've offered $1 total for both, but I was a little rusty and a little rattled. Ah well, I feel kind of bad leaving Pokemon Crystal behind, but no biggie. The third mistake came at the sale that we bought the N64 games from. We had to ask if they had any games, and the kids working the sale brought out a bin of N64 games. We originally picked out the 4 games we got plus Super Smash Bros and Zelda: OoT. After some hesitation, the kids kind of sheepishly said that they still play a lot of these games, and they wouldn't sell Smash or Zelda. So we offered $2 for the remaining 4 and they took it. 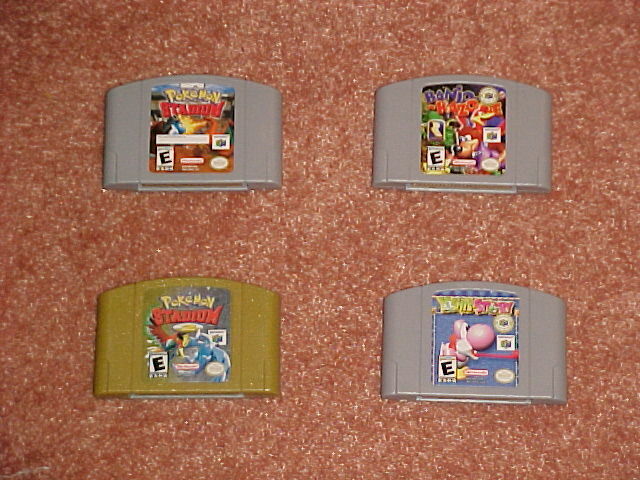 The mistake was leaving behind Mario Party 2 and 3. I didn't want to set aside too many games because I didn't know how much they were expecting on getting for them. I thought that the 6 would've been enough, but after they took away 2 of them, I should've grabbed the Mario Partys. Again, no big loss, but something I need to keep in mind so I don't let it happen again. We were too hasty in leaving. But overall it was fun. The weather was beautiful, and if there was any doubt before, yardsale season has officially started. I expect the number of sales to grow next weekend, as long as the weather stays nice. It felt so good to get back out there!